It's a Mom Thing Reviews & More! : Celebrate Baby's First Easter at Babies R Us! Giveaway hosted by Growing Up Madison! Celebrate Baby's First Easter at Babies R Us! Giveaway hosted by Growing Up Madison! Babies "R" Us stores across the country are celebrating Baby's First Easter in a big way! Stores will be stocked with everything parents and gift-givers need to make Easter special for the little ones in their life! Products will include Easter themed apparel, Easter bibs, themed plushes and toys, books, and more! With these products you will be able to make a Baby's First Easter basket perfect for your little one! In stores on Saturday, March 28th from 10-11am, parents can bring in their little ones dressed in their Easter best for festive and interactive activities for the family! Attendees will be able to experience a Bunny Hop around the store, photo opportunities, crafts, and story time! There will also be some fabulous prizes from Pampers! See more details about this event HERE! 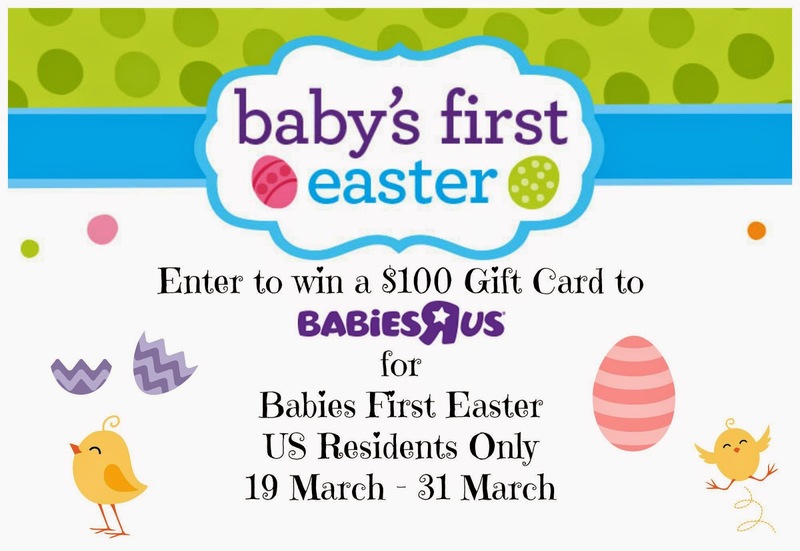 Now you have a chance to win a $100 gift card for Babies "R" Us to help make your baby's Easter super special! This giveaway is hosted by our friends at Growing Up Madison! You can visit their blog HERE!